← Acorn Squash with Shallots and Walnuts; Do you cruise? I asked someone once why they always specified ‘with meat’ (con carne) and he told me that sometimes it’s just made with beans, so the ‘con carne’ lets the diners know that meat had been added. And they always eat the Chili con Carne on rice. Perhaps it’s considered sort of a Mexican Curry. The Brits do rather love their curries…. I explained that the dish, Chili, was treated / made a little differently in the U.S., particularly in Texas and other parts of the southwest. Why am I telling you this? Because, although I was thinking ‘chili’ when I started this dish I ended up adding rice to round-out the meal. Mon mari needs his carbs. I’d be ridden out of Texas on a rail for putting chili in a zucchini, anyway…. Cut zucchini in half the long way. With a small spoon scrape out the seeds and flesh from the center forming long boat-like shells. Leave 1/4″ (.6cm) at either end to hold in the filling. Put them in a baking dish, single layer, cover with foil and bake, 400F (200C), for 30 minutes. Cook rice in beef broth until done, about 16 minutes. Heat olive oil in nonstick skillet over medium-high heat. Add chili powder, paprika, cumin, and sauté briefly. Add tomato sauce, chopped tomatoes and cook, uncovered, 10 minutes. When rice it finished, stir into meat mixture. Spoon filling into the zucchini shells. Any filling that doesn’t fit, just keep warm and serve on the side. Serve, leftover filling on the side. Add hot sauce as desired. Summer, and the potager, came to rather an abrupt halt. I still have a few tomato plants that may (or may not) produce ripe tomatoes – that are without the stinkbugs and worms and blight that are afflicting most of them at the moment. I have 2 zucchini / summer squash that are managing to produce something edible every week or so. I’m waiting to see if the little bit of green life on 1 butternut squash and 1 spaghetti squash is enough to ripen the last 2 squashes they started. 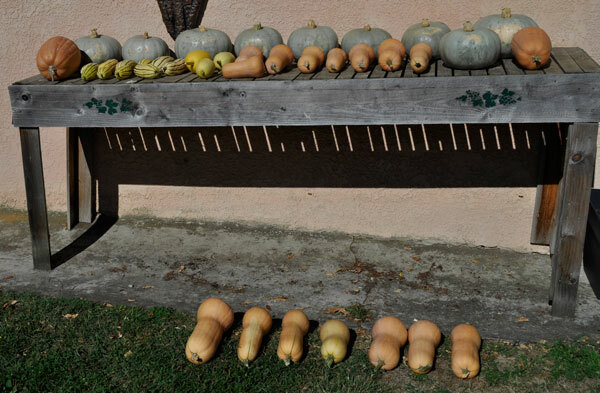 It’s been a good year – for the winter squashes. The acorn and spaghetti squashes are already in the cave. I don’t think I’ll be buying vegetables for awhile…. I would love to talk about chile and chili and that whole “with meat” thing if you’re interested. I lived in the middle of it for 12 years over on the NM border and learned a lot. 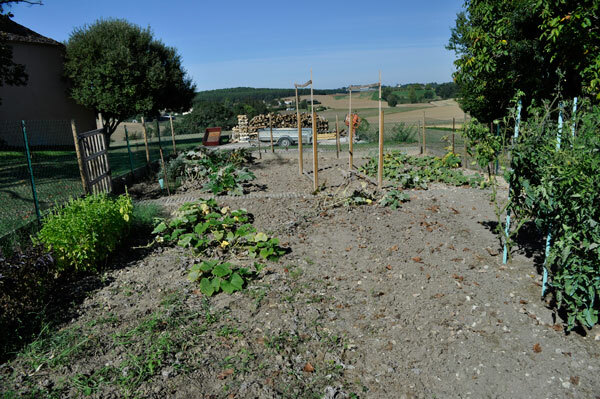 But for now I’m wondering about lardering squashes — can you do that through the winter? The last time I discussed chili with people in the US (midwest) they were debating the merits of adding Creamettes…..
How many plants of each variety did you put in? I have been picking kilos of cherry tomatoes from a few self sown plants. I left them because last year I didn’t get any from the ones I planted – next year I will limit it to two only! I love chilli con carne…with out without the meat !!! J’adore chili con (or not) carne with rice. Or with cornbread. Or with tortillas. Or in Cincinatti Skyline-style 5-way spaghetti. 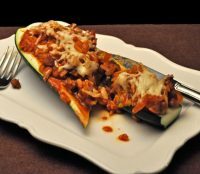 This chili stuffed zucchini looks good too! So many choices! Like you, I like them all – as long as the chef is skimpy with the hot peppers! J’adore chili con (or not) carne with rice. Or with corn bread. Or with potatoes. Or Cincinnati Skyline-style (5-way) with spaghetti. Or served over spaghetti squash. I bet it’s delicious as a stuffing for zucchini squash too. Remind me to try it next summer when zucchini are in season. I always use beans as well – ’cause I love beans! But I would never make it without meat. Cornbread is the most traditional accompaniment, chez nous…. As to the French – who needs chili when one has cassoulet? We usually add at least a little meat too. Unless there are vegetarians who will be dining with us…. Mmmmm…. cassoulet! Suddenly, I neeeeeeeeeeeeeeeeed cassoulet.